With timber decay and woodworm infiltrating many properties and buildings throughout the UK, structural timbers and fixtures could become compromised and severely damaged if left untreated. Most vulnerable when damp, timber is more likely to decay beyond repair if left damp for long periods of time. The team at Biocraft specialise in woodworm treatment Bath and provide a comprehensive surveying and treatment service for properties and buildings throughout Bath. In this article, our experts discuss some of the sources of moisture that lead to timber decay, as well as exploring behaviour and lifecycle of woodworm. To book a survey, or for professional, impartial advice on tackling woodworm and preserving timber, call our team today on 01793 272085. Before conducting woodworm treatment Bath, our team of experience timber specialists will conduct a comprehensive survey of your property. Throughout the survey, we will identify any areas that are potentially compromised and allowing sources of moisture into the property. With various building defects leading to moisture entering your home, our experienced team are aware of a variety of factors that could easily be overlooked by others. Our specialist timber survey will first outline all sources of moisture and the immediate actions that need to be carried out – including the repair of guttering or replacing blocked air bricks. Throughout the survey, we will carry out various external inspections of your property that can often result in the following findings. For more information on our comprehensive surveys please visit our timber preservation page. After external inspections have been carried out, our team will begin the survey of internal fixtures and potential sources of moisture in your home. These internal inspections include identification of condensation, solid stone or concrete floors, damaged plumbing or piping, trapped flood water, and even unventilated wooden flooring. When providing woodworm treatment Bath, all surveys and treatments should be carried out by a qualified surveyor and trained timber specialists with at least a CRST (certified surveyor in remedial treatments) qualification. The team at Biocraft are experienced in providing timber surveys and woodworm treatment Bath and are CSRT & CSSW qualified. With wood and timber being inhabited by a range of insects both in the home and in their natural environments, one of the most well-known is the woodworm. 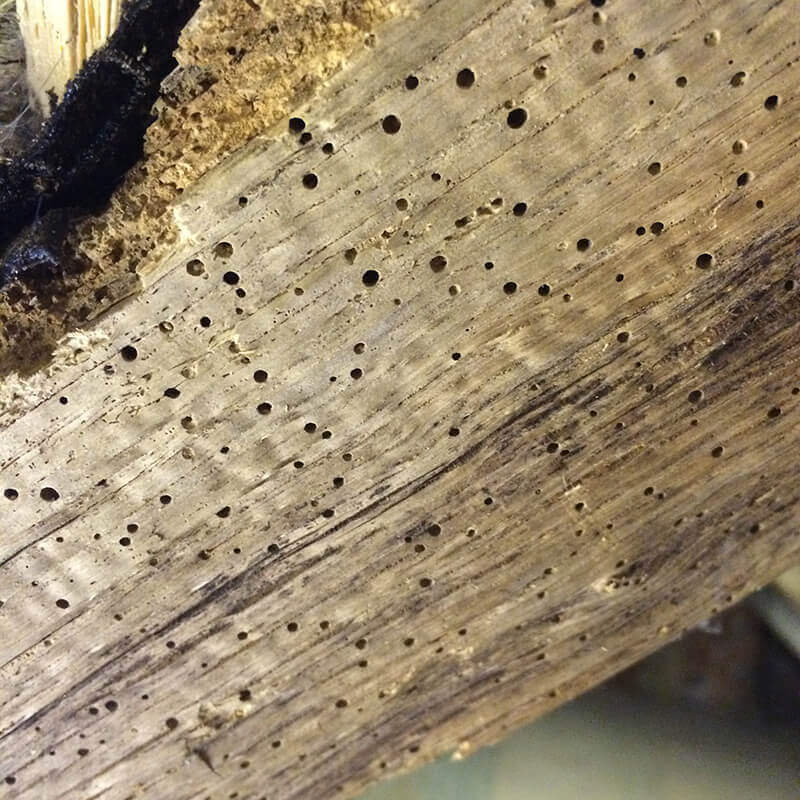 Frequently found when carrying out woodworm treatment Bath, the woodworm can be commonly identified in buildings and properties by the way it interacts with timber beams and wooden structures. 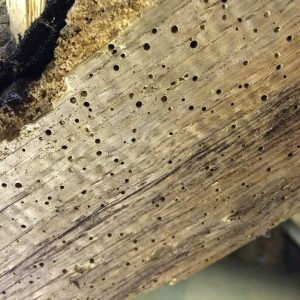 Woodworm enjoying eating and laying eggs in timber and wood that has a certain moisture content. Therefore, identifying sources of moisture and damp in your home is imperative before conducting woodworm treatment Bath. When surveying a piece of timber or wooden structure in your property, you can often identify an infestation as structures will have exit holes left behind by the grown larvae eating their way through the wood. When purchasing a property, many people request a timber survey that will often require or lead to woodworm treatment Bath. At Biocraft, our certified and experienced building surveyors can identify the type of timber infestation and recommend the most effective course of action based on findings. If left untreated for prolonged periods, woodworm can cause serious damage and begin to impact the structural integrity of the property. To book a timber survey or for woodworm treatment Bath, get in touch with our friendly and experienced team today on 01793 272085.